News — SBS Farms, Inc.
Emma Walters dominated the 3’3” Junior Hunter section at the Chagrin Valley Spring Horse Show. Held April 11-14 in Chagrin Falls, Ohio. Emma guided SBS Farms’ Stardust to the blue ribbon in three out of the five classes and then won the Junior/Amateur-Owner Hunter Classic. Emma also earned the remaining section blue ribbons aboard BTRC’s Crisp, for a complete sweep, and Crisp placed third in the Classic. Special thanks to Randi Byrd and Susan Schoellkopf for their continued support. After two amazing weeks at the World Equestrian Center in Ohio, the SBS Farms team traveled south to Wellington, Florida, to soak up some sun on the Winter Equestrian Festival. The winning momentum traveled along with them during WEF Weeks 8 and 9, February 26-March 10. During Week 8, Emma guided BTRC’s Crisp and SBS Farms’ Stardust to consistent ribbons in the 3’3” Junior Hunter, 16-17, section, with many primary colors. During Week 9, Emma improved upon her performances with both horses, earning championship honors with Crisp. “I think Emma and Crisp have a real connection, which is so nice to see,” said trainer Susie Schoellkopf. “And what Emma’s done with the gray horse, Stardust, has been phenomenal. Emma has now qualified both Crisp and Stardust for the USEF Junior Hunter National Championships to be held this summer! The SBS Farms team enjoyed two weeks at the World Equestrian Center Winter Classics 7 and 8, taking home many blue ribbons and championships. The shows were held from February 6-17, in Wilmington, Ohio. Emma and Crisp continued their momentum from 2018, as they picked up more accolades together. The pair earned the 3’3” Large Junior Hunter Championship during WEC 7, the 3’3” Junior Hunter Championship during WEC 8 and won the Junior Hunter Classic that week! Emma and Stardust also earned Junior Hunter tricolor honors, winning two classes during WEC 7. Stephanie Brennan also added tricolor ribbons to the SBS banner with her Abundance. They earned the Non-Pro Hunter championship both weeks, with five blue ribbons and multiple others over fences and under saddle. Katrina Hora and Pretty Victory also picked up excellent ribbons in the Non-Pro Hunters both weeks, with many primary colors. Sarah Rodwin and Equine Couture’s Stainless captured excellent ribbons in the Intermediate Children’s/Adult Jumpers, while Randi Byrd guided Stainless to blue ribbons in the Schooling Jumpers. Randi also piloted Hey Sailor to ribbons in the USHJA Hunter sections. 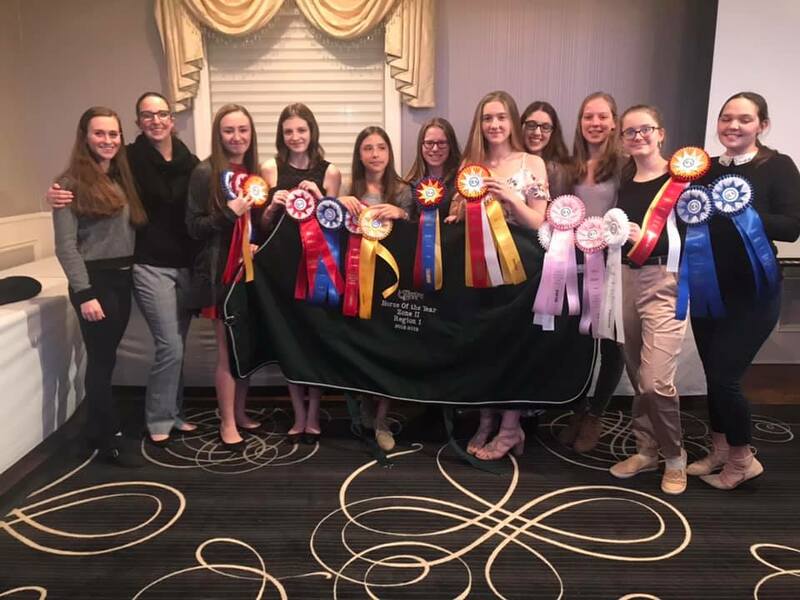 SBS Farms’ working student Emma Walters and the Buffalo Equestrian Center had an awesome weekend at the IEA Zone 2 Region 1 Regionals on February 23. The Middle School team and six individuals are heading to Zones! Several of the girls received high-score awards at the Regional Banquet, and our horses won some awards as well. Alexandra and Emma were both high-point champions for the Middle School and High School, respectively. The Middle School team was high-point champion and is headed to Zones! Winston was named best horse of the day for Regionals! Bob is the best....he helped both our riders qualify for Zones! Region 1 voted Cocoa IEA horse of the year! 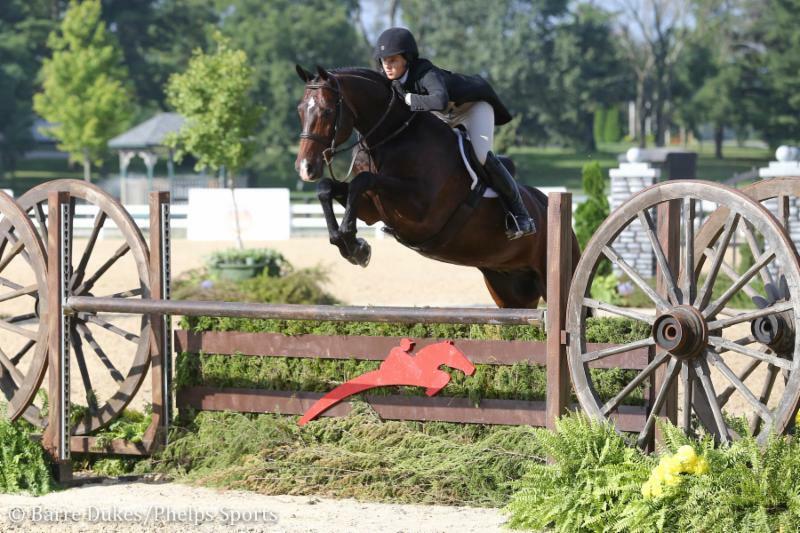 After narrowly missing out on the championship title at the Pennsylvania National Horse Show in October, 17-year-old Emma Walters, of Lancaster, New York, and Crisp redeemed themselves by earning the Junior 3’3” Hunter Grand Championship at the National Horse Show. 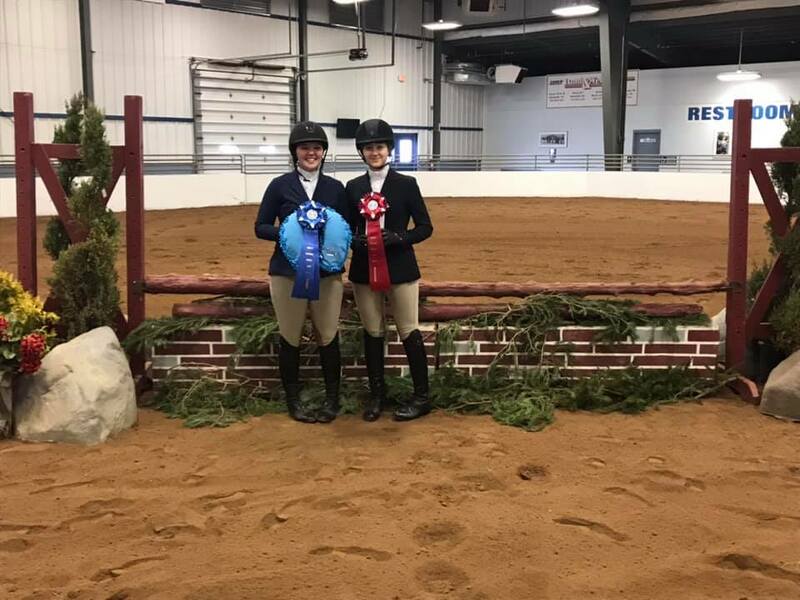 The pair claimed the 3’3” Junior Hunter, 16–17, section championship after winning Friday’s initial over fences round, Saturday’s stake class and placing second under saddle and third in the Handy round. Walters guided Buffalo Therapeutic Riding Center’s 12-year-old warmblood gelding to the accolades. Walters has been a working student for SBS Farms, Inc., since the spring of 2017 and worked in the Buffalo Equestrian Center’s lesson program prior to that. 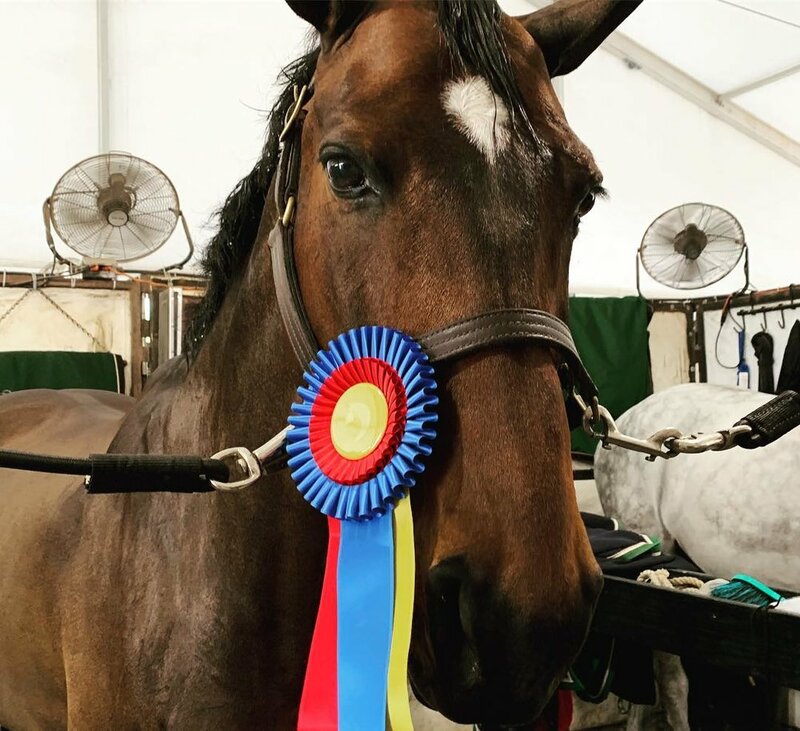 All of her hard work certainly paid off on Saturday as she ended her fall indoor season, and first time competing at the National Horse Show, with a tricolor. Special thanks to Phelps Sports for the press release and photographs. Saturday at the 72nd Annual Buffalo International Horse Show (BIHS) was packed full of exciting competition for all ages. Numerous classes led up to the day's highlight event, the $5,000 Johnson Horse Transportation USHJA National Hunter Derby. Hunter derby competition kicked off Saturday evening with Emma Walters piloting the Buffalo Therapeutic Riding Center's own Crisp to claim the victory. Walters also received the Frey Family Trophy as well as the rider bonus for her strong finish in the class. Second place was awarded to Jaime Bates riding Steve Weder's SWS Clarino, while Justin Meyers and Cool Heart, owned by Elizabeth Louisell, rounded out the top three. Earlier in the day, the junior hunter riders took to the ring to compete in the $1,000 Up The Creek Farm's Junior 3'3"/3'6" Hunter Classic, where Walters and Crisp jumped to another win. Walters concluded the afternoon receiving the Peach Taylor Sportsmanship Award along with Sarah Rodwin. Taking second place in the $1,000 Up The Creek Farm's Junior 3'3"/3'6" Hunter Classic was Annie Walsh riding her own Erosmith, while Caroline Kahn and her own mount Mango finished in third. In the competitive Junior 3'3" Hunter division, Walsh took the lead with Erosmith after earning first and second place ribbons over fences. Following close behind them was Walters with Crisp with a first and third place ribbon. The two will compete for the championship tricolor on Sunday afternoon. In the $1,000 Amateur-Owner Hunter Classic, Hannah Tuckner earned the blue riding Queen Vienna. Riding to second place was Charlene Graham aboard Knee Deep, with Angela Nealer and Essential taking home third. Other championships crowned Saturday afternoon included the Adult Amateur, 18-35, Hunter division with Christine Ruh and Gracious emerging victorious to claim the tricolor. The reserve champion in the division was awarded to Maeve Foley riding Skidmore College's Crosby. The Adult Amateur, 36 and Over, Hunter champion was Julia Barnes and Simply Cool, with Maya Schneider and Aurelius earning the reserve championship. Christine Steer rode to the Amateur-Owner 3'3"/3'6" Working Hunter championship on Saturday afternoon aboard Marvelous. Reserve honors were awarded to Michelle Gauchat aboard Le Diplomate. Steer and Marvelous also received the Grand Amateur-Owner Hunter championship award to finish off the afternoon. The BIHS is held each year as a benefit for the Buffalo Therapeutic Riding Center and is designated a Heritage competition by US Equestrian (USEF), reserved for horse shows in existence for 25 years or more. The BIHS is fortunate to be one of less than 30 horse shows nationwide that holds this illustrious status. Special thanks to Phelps Media Group Marketing for the press release. 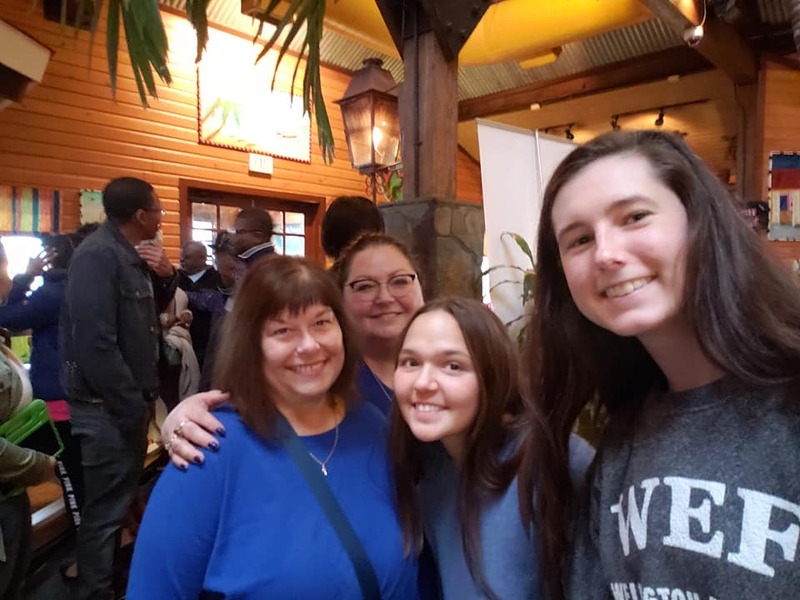 The SBS Farms team traveled to the Kentucky Horse Park in Lexington for the Bluegrass Festival Horse Show and the USHJA International Hunter Derby and Green Hunter Incentive Championships. Sharon O'Neill's Miss Lucy continued to impress with Jennifer Alfano aboard. The pair placed an impressive eighth in the Classic Round of the $289,730 USHJA International Hunter Derby Championship on August 17. The pair returned the following day for the Handy, where they placed 16th and 14th overall. Miss Lucy, the 2016 champion with Kristy Herrera aboard, continues to add to her resume even at the mature age of 16. The chestnut Hanoverian picked up impressive Derby placings at the Pin Oak Horse Show in Texas this spring before adding to her lifetime earnings at Kentucky Spring, Country Heir and the Chagrin Hunter Jumper Classic in Ohio. Jen also guided her own Candid to a solid performance in the Derby Classic Round despite the disadvantage of competing in a torrential downpour. In the 2018 USHJA International Hunter Derby money-won standings, Miss Lucy and Jen finished fourth with $24,115. That total also helped them solidly into fourth in the USHJA International Hunter Derby Lifetime Standings with $213,425 in prize money. SBS Farms' Jersey Boy, now retired, still holds the lead, with $297,851 in lifetime earnings. Jen was also recognized center ring prior to the Handy Round as the USHJA honored the past winners of the Championship during the 10th anniversary celebration. Jen Alfano, third from left, with the past winners of the USHJA International Hunter Derby Championships, from left, John French, Hunt Tosh, Liza Boyd, Kristy Herrera and Tori Colvin. In the USHJA Green Hunter Incentive Championship, Jen guided Kathy Chiaf's Kindred, Molly Gfroerer's Fortune, Debbie Marks' Fairlife and Sharon O'Neill's Talladega to solid performances and gained valuable mileage in the expansive Walnut Ring at the Kentucky Horse Park. Kindred qualified for the top 30 Championship Round out of 146 starters and finished in 22nd place, earning $929 in prize money. The team at SBS Farms, Inc. headed to the Lone Star State to compete in the prestigious Pin Oak Charity Horse Show in Katy, Texas, where they continued their winning momentum from the HITS Ocala Winter Circuit. There, they secured multiple championships in a variety of divisions over the course of three weeks. 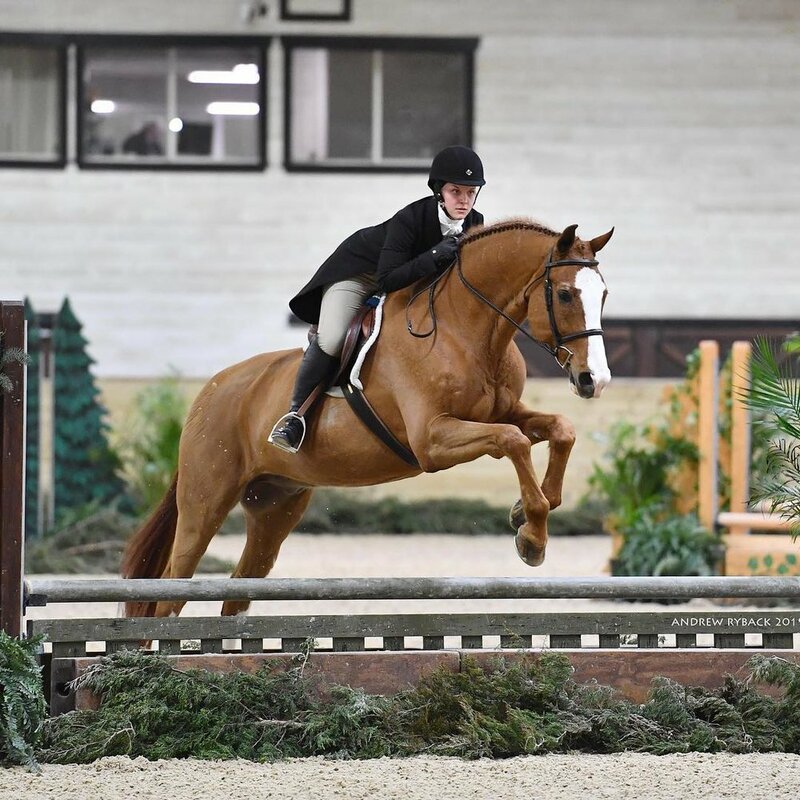 As one of the finest Hunter/Jumper show stables in the Northeast, SBS Farms, led by Susie Schoellkopf, is recognized for producing horses and riders at the highest levels of the sport. During the first week of the Pin Oak Charity Horse Show, SBS Farms head trainer Jennifer Alfano and her own Candid swept the High Performance Conformation Hunter division after earning six consecutive blue ribbons. Alfano also piloted multiple mounts in the Green Hunter divisions, where the veteran hunter rider rode Sharon O’Neill’s Talladega to a first place over fences and in the stake class, as well as a second place in the under saddle, for the Green 3’6″ Hunter championship. She also earned top placings in the Green 3′ Hunter division with her own Cooper and Fortune, owned by Molly Gfroerer. Kathy Chiaf had immense success in the 3'3" Amateur-Owner, 36 & Over, Hunter division with both of her horses, Silver Lining and Sweetwater. She won the under saddle aboard Silver Lining and guided Sweetwater to two wins over fences and in the stake round for the division championship. Emma Walters laid down beautiful trips in the 3'3" Large Junior, 16–17, Hunters to secure the championship tricolor with Crisp, owned by the Buffalo Therapeutic Riding Center, including a win in the stake round and under saddle class as well as a second place in the handy. Alfano rounded out the first week on a high note riding her longtime derby partner, Miss Lucy, owned by O’Neill, to a second-placed finish in the $30,000 USHJA International Hunter Derby. She also delivered a stand-out performance with Talladega to win the 3’6″/3’9″ Texas Super Stake and finished third with Fortune in the USHJA Green Incentive. Week 2 brought more top ribbons back to the SBS Farms tack room. In the Green 3′ Hunters, Alfano rode Fortune to a one-two punch over fences in addition to placing second in the stake round. Debbie Marks’ Fairlife also had consistent trips with Alfano in the same division. Furthermore, Fortune placed fourth in the USHJA Green Incentive, while Talladega finished second in the 3’6″/3’9″ Texas Super Stake with Alfano. Chiaf continued her success in the Amateur-Owners with Silver Lining and Sweetwater, while junior riders, Gfroerer and Walters, also showcased their talents during the second week of competition on behalf of SBS Farms. Gfroerer guided Fortune to great trips in the Modified Children’s Hunters, while Walters and Crisp captured the blue ribbon over fences in the 3'3" Large Junior, 16–17, Hunter division. Kathy Chiaf's Kindred and Jennifer Alfano won the Texas Super Stake and the USHJA Green Incentive during Week 3. The team concluded their trip to Texas with more championships during the final and third week of the Pin Oak Charity Horse Show. With Alfano in the irons, Candid once again swept the High Performance Conformation Hunter division, while Kindred, owned by Chiaf, secured the championship in the 3'3" Green Hunter division. Talladega also took home the reserve championship with Alfano in the 3'6" Green Hunter division. Wrapping up competition at the Great Southwest Equestrian Center, Alfano claimed two top 10 placings in the $15,000 USHJA National Hunter Derby, finishing second with Crisp and seventh with Fortune. Miss Lucy collected another second-placed finish in the $50,000 USHJA International Hunter Derby with Alfano, while more blue ribbons came from Talladega and Kindred, who won the USHJA Green Incentive during Week Three, in the 3’6″/3’9″ Texas Super Stake and 3’/3’3″ Texas Super Stake, respectively. The team at SBS Farms will head back home to Buffalo, New York, for a much deserved break before continuing on with their spring competition schedule at the Kentucky Spring Horse Shows and Devon Horse Show in May. Scott Stewart and Playbook competing in the 2017 Platinum Performance/USHJA Green Hunter Incentive Championship. I attended the United States Hunter Jumper Association (USHJA) convention in December and I came away with one major question: is our membership under a strong leadership or is our membership under a strong dictatorship? I have volunteered for this organization for more years than I can count — when it was the AHSA, USEF and now the affiliate, USHJA. I feel that we have lost our strength in the hunter community when we lost our committees. As we move forward, we have to continuously look at our history. We used to have standing committees full of respected and knowledgeable people who gave so much time to our sport. If the Equitation Committee came up with an idea, we all respected their knowledge and expertise — the same with the Junior Hunter Committee and Pony and Jumper Committees. However, when changes were made to the bylaws, a lot of these committees were taken away. Now, when committees vote on things or put rule changes forward, it goes to either the Hunter or Jumper Working Groups where it gets voted on and then sent to the board of directors. Whereas before, any proposals made by a committee would automatically move forward as a rule change. The communication was so much stronger before we had the Hunter and Jumper Working Groups. Those of us regularly showing, training or working out in the field have lost our confidence in the leadership of our organizations. Getting people together and trying to come up with healthy ideas that mean something are long gone. The norm now is if you disagree with the leadership, you are removed from a committee. In the past, many of the committees I served on were full of healthy disagreements, discussions and respect for our fellow committee members. In the end, we seemed to always come up with the right solution and do what was best for our riders, owners and horses. Our committees need people who have been leaders for a long time as well as those who are new to committee life and want to learn the way. Yet, committee members have resigned because they go to the convention, vote on changes and find out that those rules did not get through the layers of “yes” votes. The layers are the Hunter and Jumper Working Groups, the board of directors and the president. People are walking away from these committees and not going to the convention anymore because they’re so discouraged, and we’re losing really, really good people. In 2013, I was head of the Hunter Committee, which was filled with top hunter professionals, and Joey Darby brought me an idea for a concept where professionals could show, win money and compete in a national championship. This concept became the Pre-Green Incentive Program (now the Green Hunter Incentive Program). We invested in this program as a committee with our time and financial backing. Colleen McQuay, who had experience implementing a similar concept in the reining world and was successful in starting four $1 million programs, was chosen to help lead our group. We would not have been able to start this program without her expertise. After putting this great program in place, the USHJA powers to be came up with another program called the Pre-Green Stake that directly conflicted with the incentive program. The Pre-Green Stake was voted down by each committee as well as the Hunter Working Group and low and behold it was passed at the board level. That is not listening to the people and to the members. Scott Stewart and Playbook receiving their awards during the 2017 Platinum Performance/USHJA Green Hunter Incentive Championship. Colleen has fought tooth and nail to keep the Pre-Green Incentive Program moving forward and I for one would like to thank her for her hard work and dedication. Currently in 2018, with the installment of the 3’6” and 3’9” incentive, enrollment is up and over the total number of horses enrolled in 2017. It is clear that it is a program that owners want. Another recent example was a proposed secured stabling concept for the USHJA International Hunter Derby Championship. The concept was expensive and unnecessary, and was opposed by all of the committees and the Hunter Working Group, but, yet again, it was passed. If we, the committee members, who are out in the trenches week after week actively participating at the top of the sport, say we don’t want something and it’s turned down by every committee, including the Hunter Working Group, how does it then go to the board and get approved? These are only two examples that come to mind of rule change proposals conceived by committees that were ultimately voted down through our organization’s many layers. However, they are only a small percentage of many reasons why people have decided to walk away from both organizations (USHJA and USEF) in recent years. I believe the USHJA needs to bring back the committees and abolish the Hunter and Jumper Working Groups. They’re just another layer. Then, if I’m the head of the Hunter Committee, I’ll state my proposal to the board, explain why we’re doing it and the reason and then they’ll get to ask questions before making a decision. We just need to simplify the process, it’s gotten way too complicated. It’s layer after layer after layer. The International Hunter Derby and Green Hunter Incentive Committee, under the leadership of Ron Danta, is one of the hardest working committees I have ever been on but it has been an uphill battle. The concepts that Colleen and Ron have put forward were never fully explained to the board or Hunter Working Group, thus their ideas were halted, changed or ignored. The board must ask questions and represent the members by understanding the concepts. Apathy has won. People are walking away and shaking their heads because their voice is not heard. We are supposed to be a team that is led by people who have the knowledge and experience to know what works and what does not work. Board members should take on their jobs because they want to help steer the ship in the best interest of our equines and membership. They must listen to the membership and work together, not stay on the board because they like the position and are going to constantly say yes to the president no matter what they are told. Presidents are supposed to listen to the people who agree with them AND the people who disagree with them. We need to get back on track and we need to work together to make our sport stronger. From the show ring to the Buffalo Therapeutic Riding Center (BTRC), Susie Schoellkopf has committed her life to serving the equestrian community. Schoellkopf has served as the executive director of the BTRC since 1990 in addition to being a dedicated US Equestrian (USEF) and USHJA board and committee member. Owner of SBS Farms, Inc. alongside head trainer Jennifer Alfano, based in Buffalo, New York, Schoellkopf is a sought-after R-rated judge and has presided over some of the most prestigious horse shows in the country. She’s trained multiple horses to national championships and is best known as the owner of Jersey Boy, the three-time US Equestrian Horse of the Year (2009–2011) and winner of the 2012 USHJA International Hunter Derby Championship. In 2014, Schoellkopf was inducted into the National Show Hunter Hall of Fame. Special thanks to Phelps Sports for publishing the original column. Fresh off his championship in the High Performance Conformation Hunter division just one week ago at the Pennsylvania National Horse Show, Candid, owned and shown by SBS Farms, Inc. head trainer Jennifer Alfano, traveled to the World Equestrian Center Invitational in Ohio. There, he added another championship win to his name in the Conformation 3'6"/3'9" Hunter section. Alfano and the 9-year-old Holsteiner gelding, also known as "Sheldon" in the barn, clinched the tricolor after securing five blue ribbons and finishing in fourth place in the handy. Five years ago Alfano purchased Candid for the USHJA Pre-Green Incentive Program. She saw a horse with the capacity to climb the ranks and become one of the industry's best. Together the pair have exceeded all expectations as he journeys up the hunter pipeline. "Jennifer and Candid are a great team; it's so nice," said SBS Farms owner Susie Schoellkopf. "She has done all of the work on him and has brought him along from Pre-Green to now. I don't think there are many professionals who have done that, so it's a feather in her cap." Alfano also rode Sharon O'Neill's Talladega and Susan Kimberly's Girl Crush to reserve championship wins in the Green 3'3" Hunter division and Performance 3'3" Hunter division, respectively. O'Neill's Miss Lucy returned to the show ring in top form with Alfano once again as well, claiming two blue ribbons in the over fences and handy rounds of the High Performance Hunter division. Next, Schoellkopf will be heading to Lexington, Kentucky, to judge the National Horse Show at the Kentucky Horse Park October 31-November 5, one of the most highly anticipated indoor horse shows of the year. In addition, SBS Farms will be gearing up for the 28th annual George Morris clinic at the Buffalo Therapeutic Riding Center November 10-12 while also preparing for the 2018 Winter Equestrian Festival in Wellington, Florida. Special thanks to Phelps Media Group, Inc. for the press release. Jennifer Alfano and Stardust topped the $5,000 Johnson Horse Transportation USHJA National Hunter Derby. The class was a featured event of the 71st annual Buffalo International Horse Show (BIHS), September 13-17 in Buffalo, New York. Hunter derby competition kicked off on Saturday evening, where SBS Farms, Inc.'s own Alfano and Stardust claimed the victory. Alfano continued to impress the judges to take home second place in the class with Kathy Chiaf's Silver Lining, while Jennifer Gurney rode her own Gianni to a third-placed finish. Emma Kurtz and Rebekah Warren's Enticement took home the blue in the $1,000 Up The Creek Farm Junior 3'3"/3'6" Hunter Classic earlier in the day on Saturday. Emma Walters and Crisp, owned by the Buffalo Therapeutic Riding Center (BTRC), finished in second place and Jenna Drago and Peter Pletcher's Sandriano finished third in the class. The competitive Junior 3'3" Hunter division also kicked off on Saturday with Walters claiming first place with Alex Trolli's Del Piero and second place with Crisp in the first over fences class. The talented young rider stayed consistent in the second round of over fences competition, taking home the blue with Crisp and second place with Del Piero, setting herself up nicely to earn the championship with either of her two mounts on Sunday. In the $500 "Shogun" Adult Amateur Hunter Classic, Clare Karlovec and her own Milord Du Valon came away with the win. Nora Frisch and Kaitlyn Kurtz's Palm Beach finished just behind the pair in second place, and Stephanie Brennan on the Buffalo Therapeutic Riding Center's Manolo rounded out the top three. In the jumper ring, Jessica Mundie rode her own Camalii to a win in the $2,500 S.A. Comunale NAL Children's/Adult 1.15m Jumper Classic. Aaron Donnan rode Charity Donnan's Real Super Quick into second place, and Emma Seving took third place with her own Quidam's Zeus Z.
Donnan also rode Charity Donnan's After Joe into first place in the $1,500 S.A. Comunale Low Children's/Adult 1.0m Jumper Classic. Shauna Pingrey and her own Fabrianna DR finished in second place, and Sherri Terhaar and her own Dukato finished in third place. For his consistent top performances over the course of Friday and Saturday, Donnan was awarded the championship in the Children's/Adult 1.0m-1.15m Jumper division at the BIHS with Real Super Quick on Saturday. Reserve champion honors went to Jessica Mundie and Camalii. Other champions crowned on Saturday included Clare Karlovec and Milord Du Valon in the Adult Amateur, 18-35, Hunter division, Christine Steer and Marvelous in the Adult Amateur, 36 and Over, Hunter division and Santa Maspane and Kennedy in the Low 3' Hunter division. The BIHS is the most prominent fundraiser of the year for the BTRC. The BIHS is an AA rated hunter/jumper show and offers excellent preparation for horses and riders who will be competing at indoor finals this fall as the facility features one of the largest indoor riding arenas in the nation. Whether you attend this year's BIHS as preparation for the fall indoor circuit and zone finals or to cheer on your friends and family, the BTRC welcomes you to their home and wishes all exhibitors a fun and successful show! For more information regarding the BIHS and BTRC, please click here. The 71st installment of the Buffalo International Horse Show returns to Buffalo, New York, Sept. 13-17, at the Buffalo Therapeutic Riding Center. This year's event will be dedicated in memory of the late John R. Steele, DVM. The international sport horse community lost one of its legends earlier this year with the passing of Dr. Steele. "Doc" as he was lovingly known by many, was a pioneer in sport horse medicine and had a distinguished career as an equine veterinarian. Dr. Steele passed away on Feb. 24 at 91 years old. "Doc has been such an intricate and positive part of SBS Farms and the BTRC for over 40 years," said Susie Schoellkopf, executive director of the BTRC. "The horses came first. He always reverted back to the remedies he learned from great vets and trainers from his Standardbred days. Rest and long-time therapy came first. He was not a believer in quick fixes. He taught us all to be better horsemen." Dr. Steele defied his age by continuing to treat horses until the week before his passing. His work ethic was second to none, and he is recognized around the world for deeply understanding the "whole horse." Baby Green Hunters will have no entry fee. Bring your young ones to the BIHS for their first show experience! Junior riders will earn a $25 credit for attending a horsemanship class on Sunday morning! Trainers who bring five showing horses will receive one free stall; bring 10 or more and get two stalls free! All showing horses will be included in a drawing for free entries and one free stall on Saturday night (US Equestrian Federation fees not included)! The BIHS is a premier rated Hunter/Jumper show and offers excellent preparation for horses and riders who will be competing at the indoor finals this fall as the facility features one of the largest indoor riding arenas in the nation. Submit your entries today! EVENT: The 71st annual Buffalo International Horse Show, which benefits the Buffalo Therapeutic Riding Center. WHAT: The prestigious Buffalo International Horse Show (BIHS) is a AA rated hunter/jumper show and is one of the best ways for exhibitors to prepare themselves and their horses for the fall indoor circuit. The horse show also offers generous prize money in every division and is sanctioned and recognized by US Equestrian, Syracuse PHA, Ohio PHA and the WPPHA. The BIHS is designated a 'Heritage' competition by US Equestrian, reserved for horse shows in existence for 25 years or more that have promoted and grown equestrian sport and made contributions to the community outside the gates of the horse show by achieving, maintaining and promoting the equestrian ideals of sportsmanship and competition. ADMISSION: Admission to the horse show is FREE, with the exception of Friday and Saturday evenings after 5 p.m. Admission will be $5 per person and 100 percent of the proceeds benefit the Buffalo Therapeutic Riding Center. PARKING: Parking is available on Amherst Street or behind the property on Great Arrow Drive. On the weekends, parking is available in the Tapestry Charter School parking lot. FACILITY: The Buffalo Saddle and Bridle Club was built in 1922 as an indoor polo arena. Today it is known as the Buffalo Therapeutic Riding Center and features one of the largest indoor riding arenas in the nation. Located in the heart of metropolitan Buffalo, New York, it is now the home of the Buffalo Equestrian Center and SBS Farms, Inc. The five-acre site includes the indoor 120 x 90 riding arena, stables, paddocks and an outdoor riding ring. The spectacular barn offers permanent stalls for all horse show participants. 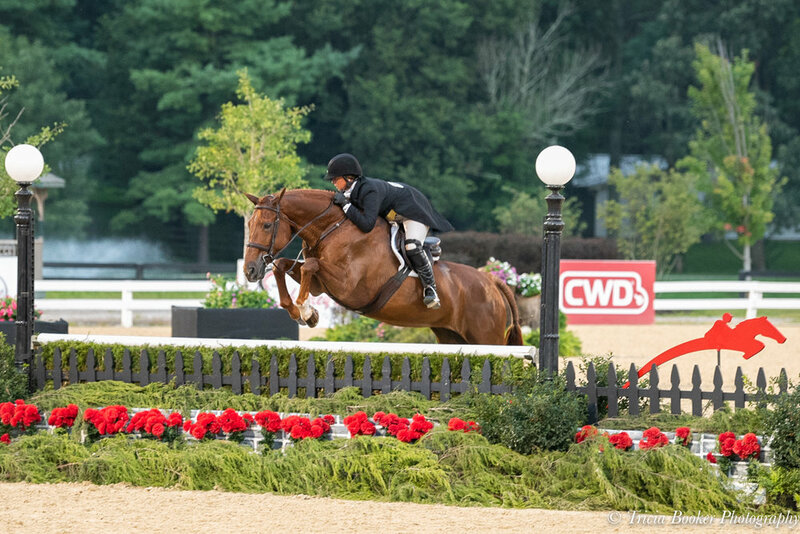 In addition to the retirement of SBS Farms, Inc.'s legendary Hunter Derby Champion Jersey Boy, the team produced consistent top results and created lasting memories at the Bluegrass Festival Horse Show at the Kentucky Horse Park. 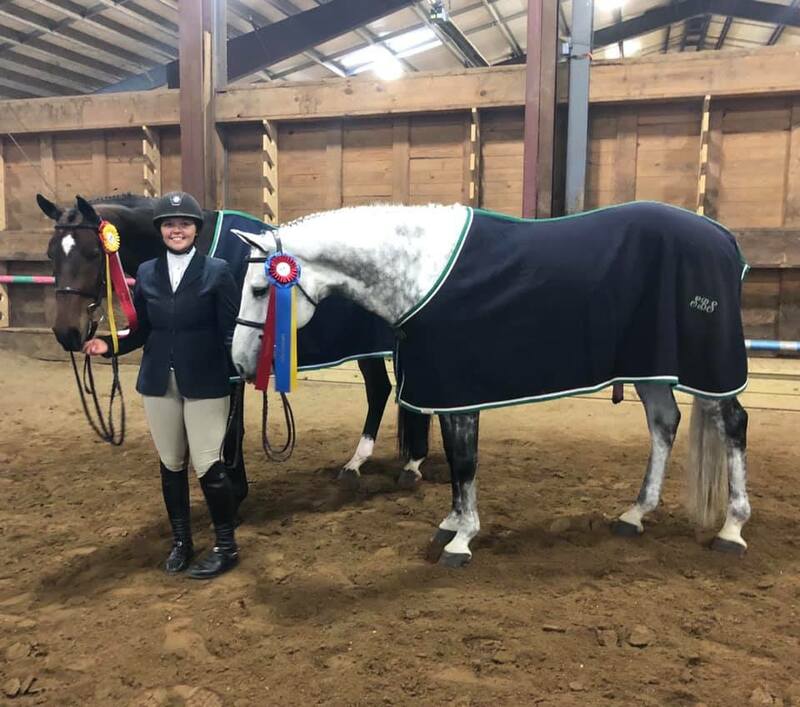 Head trainer Jennifer Alfano had a successful showing in the competitive Platinum Performance/USHJA Green Hunter Incentive Championship, where SBS Farms had three qualified horses competing. After the Round 1 of competition, which kicked off on Tuesday, August 15, Alfano sat in third place aboard SBS Farms' Stardust with a score of 262. Alfano and Kathy Chiaf's Kindred also finished among the top 10 after the Round 1 in sixth place with a score of 259.5. Yet it was Alfano and Sharon O'Neill's Talladega who advanced to Thursday's Championship Round and scored a 233 to finish 19th overall. Next came the USHJA International Hunter Derby Championship. In Friday's Classic Round, Alfano took home an impressive sixth place with O'Neill's Miss Lucy, who won the 2016 USHJA International Hunter Derby Championship with SBS Farms rider Kristy Herrera. The pair was awarded scores of 88, 85 and 86.8 from the three panels of judges. Combined with the points they collected from choosing all four high-option fences, Alfano and Miss Lucy finished with a total score of 271.8. Alfano's Candid and Herrera also claimed a high placing in the Classic Round, earning scores of 87, 92 and 88 from the judging panels. The pair took 10th place in the prestigious class after finishing with a score of 267. Herrera also rode Emily Cherney's Kensi to a good finish in the Classic Round, earning a score of 254.6. During Saturday evening's Handy Round, and after an emotional start to the championship's grand finale with Jersey Boy's retirement ceremony, Alfano and Miss Lucy received a score of 270.55 to take home ninth place overall with 542.35 points. Herrera took 19th and 20th places with Kensi and Candid, respectively, with final scores of 477.60 and 467. Miss Lucy showcased her versatility at the Bluegrass Festival Horse Show, competing with Alfano in the Performance 3'6" Hunter division. Alfano also campaigned Girl Crush, owned by Susan Kimberly, and Chiaf's Silver Lining in the Green 3'6" Hunter division, while Chiaf took her turn in the saddle and secured top results with Silver Lining in the 3'3" Amateur-Owner, 36 and over, Hunter division. Other SBS Farms horses and riders competing at the Bluegrass Festival Horse Show were Molly Gfroerer and Silver Icing, owned by Samantha Hurley, who produced top results and collected a first place in the Children's Small/Medium Pony Hunter division. Emma Walters and the Buffalo Therapeutic Riding Center's Crisp also received good scores and represented SBS Farms well in the competitive Junior 3'3" Hunter division. Next, the SBS Farms team will commence their fall competition schedule, which includes the Diamond Mills $500,000 Hunter Prix Final September 8-10 at HITS Saugerties, the Buffalo International Horse Show, September 13-17, and the Rolex Central Park Horse Show, September 20-24. Special thanks to Phelps Media Group, Inc., for the press release. SBS Farms, Inc. announced on August 9 that their legendary Hunter Derby champion and Performance Hunter, Jersey Boy, was officially retiring at the 2017 USHJA International Hunter Derby Championship on Saturday, August 19. SBS Farms owner Susan Schoellkopf and rider and trainer Jennifer Alfano made the decision to conclude 15-year-old Jersey Boy's competitive career with heavy hearts due to a recently diagnosed tendon injury. "I'm sad, obviously," said Alfano after Saturday's retirement ceremony. "This was a great place to do this for him - it was very fitting. He has been a big part of my life for a long time. [Our career together] meant everything. He's a horse of a lifetime. He will do things that no other horse will ever do for me. Our lives will not be the same without him." "I don't think there is ever going to be another pair like [Jennifer and Jersey Boy]," said Schoellkopf. "To me, they've really created the derbies. They were always a pair to be reckoned with no matter where they were. The harder it was, the better they were." The once-in-a-lifetime horse for Schoellkopf and Alfano in the form of a chestnut Hanoverian gelding by White Star is fondly known around the barn as "Lewis." Jersey Boy, who's been described as the "quintessential derby horse," and Alfano collected innumerable victories in the show ring together, the largest of those winning the $100,000 USHJA International Hunter Derby Championship in 2012. The famous pair also claimed the reserve championship in the prestigious competition in 2009 and 2014. In addition, the hunter derby superstar still firmly stands atop the USHJA lifetime money-won leaderboard and has won the George H. Morris Perpetual Trophy four times as the highest money earner. We bought [Jersey Boy] as a 4-year-old," said Schoellkopf. "We tried him at Saugerties for the first time, and I said to Jennifer, 'He looks like a cute horse; he'll probably make somebody a nice horse.' We had no idea that he would become the athlete he is today. Jennifer created him. We showed him in the jumpers for a while and then decided to do the hunters and the rest is history. "He's such a powerful jumper and could do all of the turns faster and harder than anybody," continued Schoellkopf. "He's a very quirky horse, and with somebody else, he wouldn't be the horse that he is now. When he would be quirky, Jennifer would just ignore it. Not many riders would have done that. When Jennifer took chances, they would win. It didn't matter how big the course was or how hard it was. They always rose to the occasion. I don't think we will see a connection like theirs again for a long time." Jersey Boy turned out to be the unlikely "golden boy" in the hunter arena, racking up tricolor ribbons in the Performance Hunter divisions as well as in the derbies. Bringing Alfano along for the ride of a lifetime, Jersey Boy first started his derby winning streak in 2008, where he won the International Hunter Derby at the Chagrin Valley Hunter Jumper Classic Horse Show. The gelding has a total of 31 class wins under his belt, as well as other high honors including being named USEF High Performance Horse of the Year in 2012 and 2013 and Hunter Horse of the Year in 2012 by the National Show Hunter Hall of Fame. In addition, he was named the 2012 US Equestrian's National Horse of the Year and was selected to showcase the power and beauty of Hunters at the 2010 World Equestrian Games in Kentucky with Alfano. Jersey Boy's abundantly successful career has taken him and the SBS Farms team to numerous prestigious horse shows across the country, earning countless championships and derby victories at the Devon Horse Show, the Pennsylvania National Horse Show, the Washington International Horse Show, the National Horse Show and the Capital Challenge, to name a few. Before his injury, Jersey Boy and Alfano were qualified to compete in this year's championship for the eighth time. Prior to Saturday's Handy round of the 2017 USHJA International Hunter Derby Championship, Jersey Boy was honored and recognized for his incredible athleticism, talent and success as one of the best International Hunter Derby horses in a special retirement ceremony held during the opening ceremonies at the Kentucky Horse Park. Jersey Boy enjoying the ceremony. Next, Jersey Boy will enjoy his well-deserved retirement at Stacy Sandbothe's farm in Prospect, Tennessee. "Jennifer and I would like to thank Lewis for taking us on this amazing journey and for giving us both a horse of a lifetime," said Schoellkopf. "Without Jennifer, he would not have had the fantastic career he has had with so many wins that are too numerous to list. They were a team that will go down in hunter and derby history. He is a character that his caregivers will never forget! Life without Lewis will be very hard but the memories will last forever." 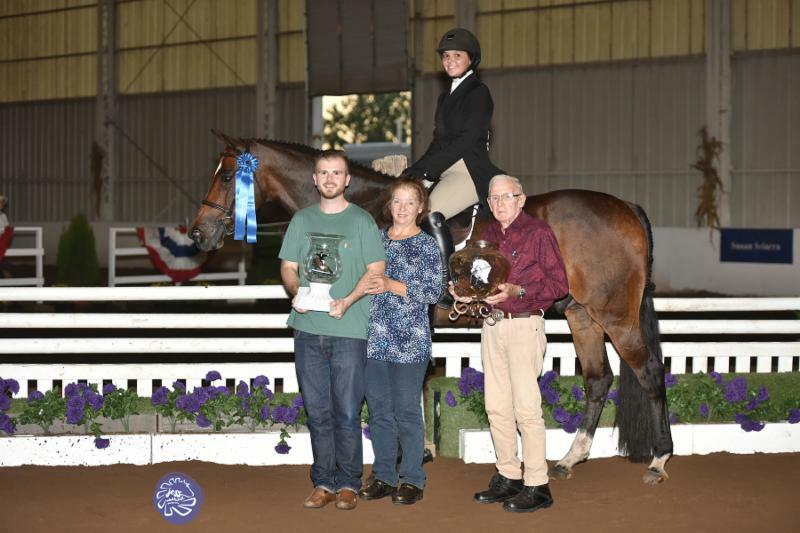 The SBS Farms, Inc., team has been racking up ribbons and championships throughout the second week of competition at the Chicago Festival of the Horse at the Lamplight Equestrian Center. On Sunday, August 6, SBS Farms head trainer Jennifer Alfano rode Sharon O'Neill's Miss Lucy to an exciting win to close out Equifest II in the $10,000 USHJA International Hunter Derby. After two rounds that impressed both panels of judges, Alfano and Miss Lucy finished first in the large class with a final combined score of 388.5. "She was great today," Alfano said of Miss Lucy. "She jumped amazing like she always does. I was really happy with her. She just has an amazing jump and she's so powerful. There's nothing that she doesn't handle well." In the first round, the pair received scores of 86 and 92 from the two judging panels. Combined with an additional eight points for taking all of the higher options on course, Alfano and Miss Lucy were awarded a total score of 186 to win the Classic Round. Returning for the Handy Round, the pair were given a score of 85.5 from one judging panel and a score of 93 from the other. After adding the additional eight points for higher options as well as a handy bonus of 16 points, Alfano and Miss Lucy's handy round score totaled to 202.5. Their high combined score of 388.5 secured their place in the winner's circle. "It was a large class, and it felt really good [to win]," Alfano explained. "I've been out for a while with an injury, so I'm really just starting back up again. I was really happy that she went so well today." Miss Lucy was not the only SBS Farms performance horse to take home a big win during the week. Candid, owned and ridden by Alfano, secured the championship title in the competitive High Performance Conformation 3'9" Hunter section. Kathy Chiaf rode her own Silver Lining to a championship title as well, taking home the tricolor in the Amateur-Owner 3'3" Hunter division. Emma Walters, aboard the Buffalo Therapeutic Riding Center's Crisp, was also champion in the Junior 3'3" Combined Hunter division. Alfano took home a reserve championship ribbon in the Green 3'6" Hunter division riding Susan Kimberly's Girl Crush. She also rode O'Neill's Talladega to several great finishes in addition to claiming the reserve championship in the Green 3'3" Hunter division and second in the USHJA Green Hunter Incentive Program class on Thursday. Next, the SBS Farms team will head to Lexington, Kentucky, to compete at the 2017 USHJA International Hunter Derby Championship at the Kentucky Horse Park, August 17-19.